Although you can include safflower oil -- in moderation -- in your diet and successfully shed pounds, consuming safflower oil regularly isn’t a guarantee you’ll lose weight. But safflower oil can provide you with some health benefits during your weight-loss journey and may affect your body fat. Reducing your overall calorie intake and eating safflower oil in recommended portions give you a good shot at successful weight loss. Safflower oil is not a low-calorie food, which is why eating too much of it can hinder weight loss. Just 1 tablespoon of safflower oils contains 120 calories. That's about on par with other oils and fats, but significantly more than most foods common to a weight-loss diet. In comparison, 1 cup of celery contains 16 calories, and raw spinach provides just 7 calories per cup. Effective weight loss at a rate of 1 to 2 pounds weekly means you must burn about 500 to 1,000 calories more than you eat every day, notes Harvard Health Publications. 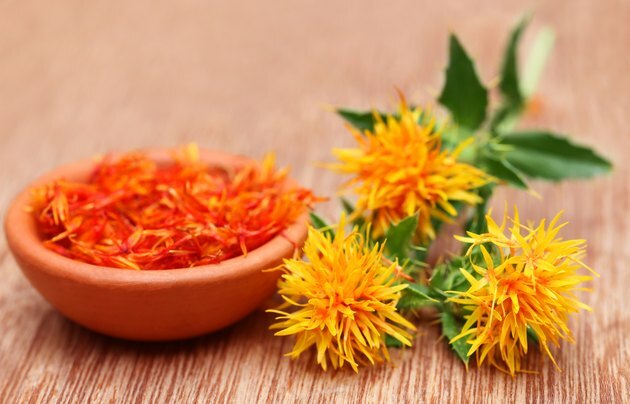 Ingesting safflower oil in moderation during weight loss may be beneficial for blood glucose levels -- which is important if you have diabetes -- and heart health, especially when used in place of saturated and trans fats. A study published in 2011 in “Clinical Nutrition” found that ingesting 8 grams of safflower oil daily improves blood sugar -- and increases healthy high-density lipoprotein cholesterol but reduces inflammation. This lowers your risk of heart disease. The amount of safflower oil -- or any other plant-based oil -- you should consume daily depends on your weight-loss calorie requirements. For example, women eating 1,200 calories to shed pounds need about 4 teaspoons, or 17 grams, of oils daily, and men following 1,600-calorie weight-loss plans need about 5 teaspoons -- equivalent to 22 grams -- of oils each day, suggests the publication "Dietary Guidelines for Americans, 2010."